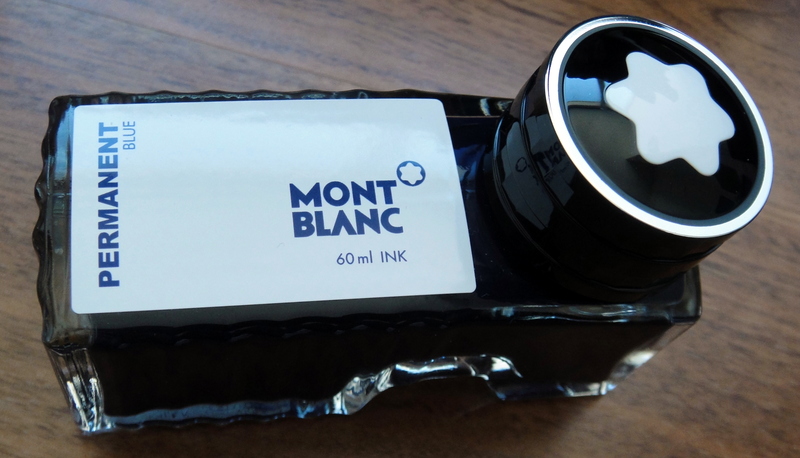 Montblanc has released two new permanent inks, Permanent Blue and Permanent Black. Both of these new inks are ISO 14145-2 certified; this is the same standard applied to roller ball refills with permanent ink suitable for documents. Montblanc Mightnight Blue was previously formulated as a permanent ink but I do not believe it held this same ISO certification. The new Midnight Blue is no longer permanent. Interestingly, the Permanent Black costs $28 while the Permanent Blue costs $17 (same as the other MB inks). I went for the Blue because the saleswomen couldn’t explain to me why the black was worth an extra $11 (…if someone knows why please let me know). The branding on the these new permanent inks is a little bit different. The boxes and labels on the bottles are white instead of the normal black with a color fade. 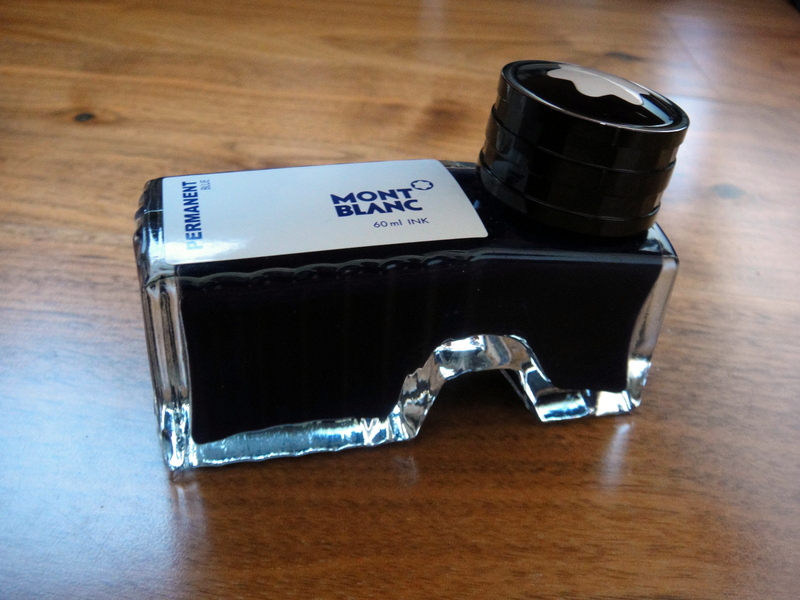 The permanent inks use the same great 60ml Montblanc bottle which has a little hump in the middle making it easy to fill your pen when the bottle is low. Montblanc does an all around superb job with their packaging. There is an expiration date on the box and bottle which is a feature I love. 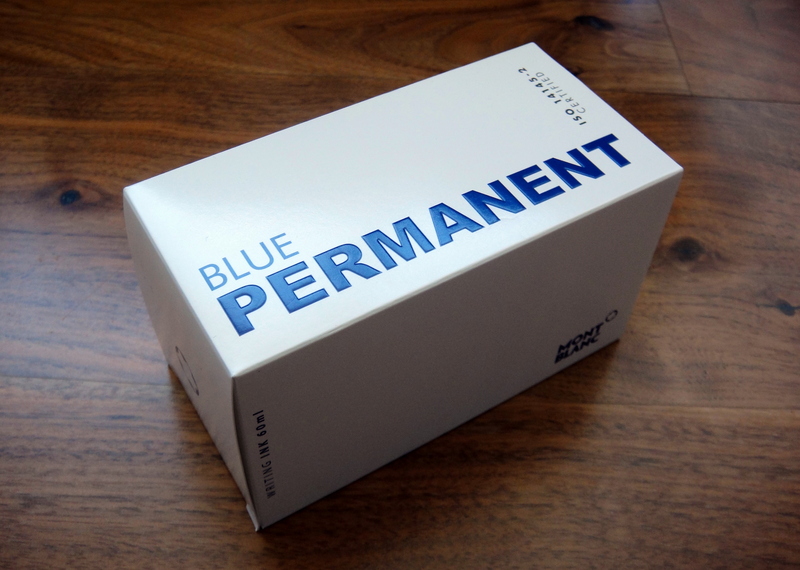 Permanent Blue is a nice true blue color with some shading. Permanent inks tend to write on the dry side and MB Permanent Blue is no exception. 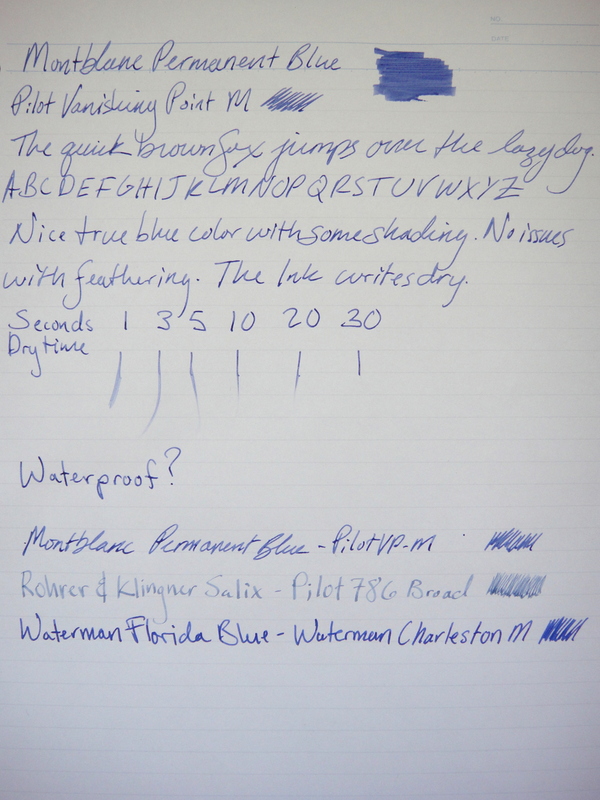 The flow was comparable to the R&K Salix (permanent) ink but noticeably dryer than the Waterman Florida Blue. I saw no feathering in my test and the ink had an average dry time on the Maruman Smooth-To-Write paper. I have tested the ink and it is completely waterproof. I dripped water on the word “Waterproof?” and the result is what you see below. Overall I really like this ink. I am going to see how it behaves in my Pilot VP for a couple of weeks and if I don’t run into any issues with clogging as I have with some other permanent inks, I will use it regularly. Pelikan has the same issue of price difference between black & blue ink, not only in ink bottles but also in ink cartridges and BP’s & RB’s refills. I was told by people working for Pelikan that the price difference between black & blue ink comes mainly from the big difference in sales between the two colours, “blue ink sells much more than black ink, which results in lower production cost for the blue ink”. This is the first time I know that MB has the same pricing policy for both colours of ink as Pelikan, both are probably the only companies with this pricing structure – and both are German companies. It is interesting to know that black ink is dominating sales in some countries while blue ink in others, all middle east countries (where I live) use mostly blue ink, for official documents must be signed in blue ink colour. I believe that most of European countries, USA & China use black ink for signing official documents, while not sure of that but at least I know France is a black ink market, and that’s why Waterman pens are sold with a black refill. When Parker used to be manufactured in Newhaven UK, we used to buy them fitted with a blue refill, which makes me assume the UK is a blue ink market. If most of Europe + USA + China are a black ink market I wonder how can the blue ink sales are much higher than the black ink!?. Thank you Jamal! I didn’t realize that it was related to sales volume. I had thought that because of the huge price difference there might be something special about the black. Hello. I have a question about this ink: do you know if it qualifies as an “archival” ink? Where I live all official document must be signed in blue and very often at the bank they won’t let me sign documents with my fountain pen, which drives me crazy because I stopped using ballpoints years ago. I thought that if I found an archival ink I could explain that it won’t fade in time and they’d let me use my fountain pen..
You can tell them that it is ISO 14145-2 meaning it is document-proof. I am not sure what your definition of archival is though. The color will likely fade out overtime leaving a grey or brown color just like Iron Gall inks do. Thanks a lot, it helps. I needed something that would last at least a decade (in normal storage conditions) and be fountain pen friendly, so I think this ink will do the job!